The effect will sent a creature flying about 100 feet. It has the appearance of a leaf blower. One of the items in the quest to get this is no longer available. Anyone selling one of these? Looking to buy one of these, please message me here with price if you have one and would like to sell it. I have one I might consider transferring to FV and selling for the right price in Krono. If anyone is interested message me. I never understood why people still say to this day that the BFG looks like a leafblower. What kind of leafblower has crystalline claws that clench together? Anyone wanting to get an up close inspection of what the BFG actually looks like, particularly the animation, should go check out Engineer Friliim in the Bixie Warfront heroic adventure. He's weilding the BFG graphic. Don't care what class or level. Looking to purchase this on any server that allows exit transfers. Send me a message. I was just putting my trader up in diamond room on Rathe server when I turn around to see a fellow trader with this weapon on. Intrigued, I pulled him up on EQ Players and saw what he was holding. Tried to copy and paste name into Alla but it only showed me 1 viable Wiki option. Chose EQ Mob:westernwastes - Breezeboot Swordrattler then clicked on the Pirate Quest and saw the reward which then allowed me to bring up this link. Assuming that it wouldn't take me straight here since this weapon and quest/questgiver are no longer in-game. A very cool looking item I must say.Got some great screenies but not sure how to post them. Will work on it and get them up if possible. This guy named Durc on the Rathe used to have one. Really whiney alcoholic loser, I bet he quit the game already. He was a barbarian warrior if that helps any. Still one floating round Stromm. Wish I could recall the name of the ranger that had it. We camped the Fabled Boots of Shadow Walking together this year, and he broke it out. Still a very sweet-looking toy. Can't remember what server he transferred from, but I took a bunch of screenies of it, cause I never thought I'd actually see one. There are little purple-ish skull decorations near the ends, and the "claw" at the end does this wierd giration animation. Wish they'd bring this sweet toy back, maybe as a new casino nodrop reward. 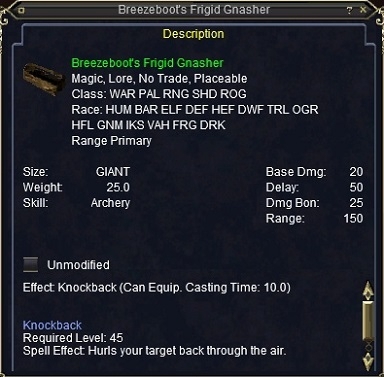 One of the sweetest graphic items in EQ. Hempy had one...where are you Hempy!! I dont think anyone that still plays does. My friend Mordiss had one, but that was long ago. #Eueadder, Posted: Aug 02 2004 at 1:48 PM, Rating: Sub-Default, (Expand Post) BTW i want a leaf blower! It doesn't matter because both are made by id. The BFG is the trademark id weapon. Not that it makes much difference now, but it never hurts to get more information. This thing now berserker usable? no its not bers usable ... sorry ... screenshot above seems accurate (from memory) only 5 classes can use ... old screen shot doesn't show casting time tho. as of yesterday ... i now own this weapon. In honor of a Gnomeball tourney and GMs last day ... it was given to me. Just some quick info regarding the BFG; 1. I have seen PC's resist the clicky effect in duel, 2. This only does 10 hps DD when cast (not 10k lol), 3. This may knockback an oppenent/mob about 10 feet or so from my observation (not 100 feet and not across the zone lol), 4. Yes it looks really cool when equipped =) ... I am curious as to what situations may be exploitable by such a weapon, or how it may be used to my benefit. If anyone knows please reply to this post ... thanks. 4. Yes it looks really cool when equipped =) ... I am curious as to what situations may be exploitable by such a weapon, or how it may be used to my benefit. If anyone knows please reply to this post ... thanks. Change your class to a ranger. in the main hand this weapon can land 1k crits while using true shot, standard crits hit as high as 500, also with AA abilities and fleeting quiver the 20/50 is more along the lines of 30/30 (in a high lvl rangers hands) I know as I own one. edit: umm i was sure that it's not possible but if you know something i don't (can change an avatars class or transfer a no-drop) ... please lemme know !! cheers! as of today does anyone know whether this quest is still broken or not? Nope its not still broken. It was never broken so to speak. It was, is, and continues to be very much overpowered and it gives rise to a number of situations that can be exploited by it. So it was removed from the game, they made the one piece impossible to get, and eventually admitted to removing the quest and having the item no longer drop. ok forgive me, i'm kinda slow ... perhaps if i could target/see (not sure if its line of sight tho) the mob w/o drawing aggro i could "knock NPC through/over walls that they couldn't get out of" well maybe if pathing allowed ... but need to test it more. mega jump ... as in knockback someone with it in duel to hurl them?? the knockback effecnt isnt too great or far but perhaps. hey thanks for the ideas! cheers! more than that, it identifies as the model 9000.